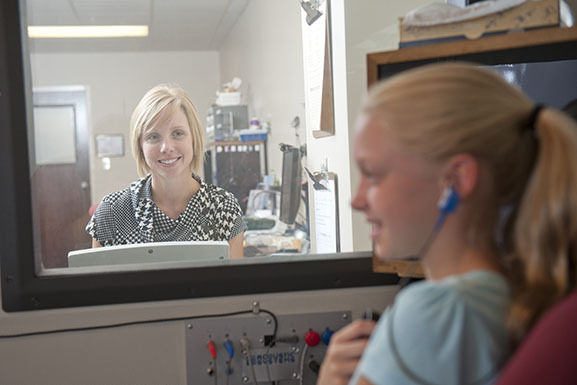 The Speech and Hearing Clinic is the oldest in the state, and is an integral part of the Department of Communicative Disorders, which celebrates its 75th anniversary this year. From the May 2013 Desktop News | This year marks the 75th anniversary of the Department of Communicative Disorders and its Speech and Hearing Clinic, the state’s oldest clinic that serves more than 9,000 Alabamians each year. As part of a series of anniversary events, the department will host a colloquium on May 18 that will address the legacy of the program and its impact on the knowledge of students in the field of speech and communicative disorders. Planned speakers for the May 18 event include Dr. Laura Moss, clinic coordinator for the Speech and Hearing Center; Sue T. Hale, assistant professor and director of clinical education in the department of hearing and speech sciences at Vanderbilt University; Dr. Tommie L. Robinson, director of the Scottish Rite Center for Childhood Language Disorders at the Children’s National Medical Center and associate professor of pediatrics at the George Washington University School of Medicine; and Dr. Gloria D. Kellum, vice chancellor emerita for University Relations and professor in communication sciences and disorders at the University of Mississippi. Hale and Robinson are former presidents of the American Speech Language Hearing Association, the national professional organization for audiologists, speech-language pathologists, and speech, language, and hearing scientists. In addition, two former students of the program will talk: Dr. Debra Dwight, assistant professor at the University of West Georgia, and Sarah Kendrick, a speech-language pathologist in Jackson, Miss. In addition to a full roster of speakers, the colloquium will be an opportunity to reminisce about the program, which is the oldest of its kind in Alabama. In 1938, T. Earle Johnson, chairman of the UA Department of Speech, began offering undergraduate academic coursework in what has come to be known as the discipline of human communication sciences and disorders. At the same time, he announced the opening of a speech and hearing clinic to serve both the local and the University communities. The first graduate-level seminar started in September 1939, and the first master’s degree was awarded in 1941. For details on the event and the department, contact Dr. Marcia Hay-McCutcheon at mhaymccu@as.ua.edu or (205) 348-4572.